Larch is the common name for any of the deciduous coniferous trees comprising the genus Larix of the pine family (Pinaceae), characterized by needle-like leaves and generally small cones. The term also is used for the wood of these trees, which is commercially valuable in several species. Larches are native to much of the cooler temperate northern hemisphere, on lowlands in the far north, and high on mountains further south. Larches are among the dominant plants in the immense boreal forests of Russia and Canada, along with such evergreen conifers as firs, spruces, and pines. Larches exhibit bi-level functionality as they meet their own needs for survival and reproduction while also fulfilling essential functions in the ecosystem. Larches provide food and habitat for a number of animals, as birds consume the tree's seeds, buds, and immature cones, and various caterpillars eat the needles. Cavities in older trees provide homes for birds and flying squirrels, and the black bear favors climbing larch for escape because of the tree's rough bark and large diameter. Humans gain commercial and aesthetic benefits from larch. The wood of various species is valued for being strong, hard, durable, and waterproof, and is in demand for building yachts and small boats, as well as railroad ties, mine timbers, telephone poles, cabinets, and fencing. Larches also are cultivated for ornamental purposes, including in bonsai culture. Larch forests with their distinctive seasonal changes from new growth bright green needles, through summer deep green and fall yellow, to the bare winter form can be a rich source of aesthetic enjoyment for humans. As conifers (division Pinophyta), larches are cone-bearing seed plants with vascular tissue. Specifically, they are gymnosperms, meaning that the seeds are not formed in an ovule that is enclosed (and developing into a fruit, as in the other type of seed plants, the angiosperms), but naked on the scales of a cone or cone-like structure. All living conifers are woody plants, the great majority being trees with just a few being shrubs. Typical examples of conifers include cedars, cypresses, firs, junipers, pines, redwoods, spruces, and yews. Unlike most conifers, larches are deciduous trees, losing all of their foliage for part of the year. Most conifers are evergreens, retaining their leaves all year round. Larches grow from 15 to 50 meters (49 to 164 feet) in height. The shoots are dimorphic, with growth divided into long shoots typically 10 to 50 centimeters (4 to 20 inches) long and bearing several buds, and short shoots only one to two millimeters long with only a single bud. The leaves are needle-like, two to five centimeters (0.8 to 2 inches) long, and slender (under one millimeter wide). They are borne singly, spirally arranged on the long shoots, and in dense clusters of 20-50 needles on the short shoots. The needles turn yellow and drop in the late autumn, leaving the trees leafless through the winter. Larch cones are erect, small, one to nine centimeters (.4 to 3.5 inches) long, green or purple, ripening brown five to eight months after pollination. In about half of the species, the bract scales are long and visible, and in the others, short and hidden between the seed scales. 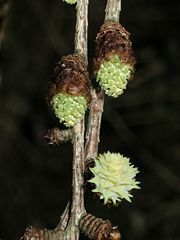 Those native to northern regions have small cones (one to three centimeters) with short bracts, with more southerly species tending to have longer cones (three to nine centimeters), often with exserted bracts, with the longest cones and bracts produced by the southernmost species, in the Himalayas. There are ten to thirteen extant species of larch. Those taxa marked with * in the list below are not accepted as distinct species by all authorities. Earle (2007) states that there is general agreement on the genus containing eleven species. In the past, the cone bract length was often used to divide the larches into two sections (sect. Larix with short bracts, and sect. Multiserialis with long bracts). However, genetic evidence does not support this division, pointing instead to a genetic divide between Old World and New World species, with the cone and bract size being merely adaptations to climatic conditions (Gernandt and Liston 1999). More recent genetic studies have proposed three groups within the genus, with a primary division into North American and Eurasian species, and a secondary division of the Eurasian into northern short-bracted species and southern long-bracted species (Semerikov and Lascoux 1999; Wei and Wang 2003, 2004; Gros-Louis et al. 2005). There is some dispute over the position of Larix sibirica, a short-bracted species that is placed in the short-bracted group by some of the studies and the long-bracted group by others. Larix principis-rupprechtii * Prince Rupprecht's larch. Mountains of northern China (Shanxi, Hebei). Larix himalaica* Langtang larch. Mountains of central Himalaya. Larix speciosa* Yunnan larch. Mountains of southwest China (southwest Yunnan), northeast Myanmar. Larix lyallii Subalpine larch. Mountains of northwest U.S. and southwest Canada, at very high altitude. Larix occidentalis Western larch. Mountains of northwest U.S. and southwest Canada, at lower altitudes. Most if not all of the species can be hybridized in cultivation. The best known hybrid is the Dunkeld larch Larix × marschlinsii (syn. L. × eurolepis, an illegitimate name), which arose more or less simultaneously in Switzerland and Scotland when L. decidua and L. kaempferi hybridized when planted together. Larches are prone to the fungal canker disease Lachnellula willkommii (larch canker); this is particularly a problem on sites prone to late spring frosts, which cause minor injuries to the tree allowing entry to the fungal spores. Larch is a wood valued for its tough, waterproof, and durable qualities. Top quality knot-free timber is in great demand for building yachts and other small boats. The hybrid Dunkeld Larch is widely grown as a timber crop in northern Europe, valued for its fast growth and disease resistance. Durable in contact with water, it is used for railroad ties, mine timbers, telephone poles, and posts. The western larch (Larix occidentalis) is native to the mountains of western North America and is a large tree reaching in rare cases up to 60 meters (197 feet) tall, with a trunk up to 1.5 meters (4.9 feet) in diameter. It is a tough and durable wood, yet flexible in thin strips, properties that make it a particularly favored wood. Larch is highly valued in yacht building, which requires wood that is free of knots and can only be obtained from old trees that lost their side branches when they were much younger. The western larch also is used for making cabinets and interior work, and small larch poles are widely used for rustic fencing. The tamarack larch, tamarack, or American larch (Larix laricina) is native to northern North America, and is used also for shipbuilding, poles, and railroad ties. It historically was used by the Algonquian people for making snowshoes and other products where toughness was required. In central Europe, larch is viewed as one of the best wood materials for the building of residences. 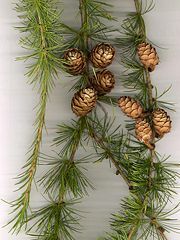 European Larch (Larix decidua), a species of larch native to the mountains of central Europe, is used for turpentine. 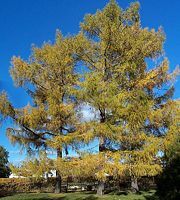 Larches also are cultivated for ornamental purposes, including the Japanese larch (Larix leptolepis), the Siberian larch (Larix sibirica), the tamarack, and the European larch. Larches are often used in bonsai culture, where their knobby bark, small needles, fresh spring foliage and especially autumn color are appreciated. European larch, Japanese larch, and tamarack larch are the species most commonly trained as bonsai. Planted on borders with birch, larches were used in pagan "sagged" cremations. One "sąg" (pronounced song) of wood was required for a cremation stack. Sąg is used today as a Polish forestry unit measuring approximately 3 × 1 × 1 meters. In Siberia, young larch leaves are harvested in spring, preserved by Lactobacillus fermentation, and used for salads during winter. Larch has also been used in herbal medicine. Ecologically, larches provide food and habitat for a number of animals. The seeds are an important food for some birds, such as siskin, lesser redpoll, and citril finch, while the buds and immature cones are eaten by Capercaillie (Tetrao urogallus, wood grouse). European Larch needles are the only known food for caterpillars of the case-bearer moth (Coleophora sibiricella). Earle, C.J. 2007. Larix. The Gymnosperm Database. Retrieved May 7, 2008. Gernandt, D. S., and A. Liston. 1999. Internal transcribed spacer region evolution in Larix and Pseudotsgua (Pinaceae). American Journal of Botany 86: 711–723. Retrieved May 7, 2008. Gros-Louis, M.-C., J. Bousquet, L. E. Pâques, and N. Isabel. 2005. Species-diagnostic markers in Larix spp. based on RAPDs and nuclear, cpDNA, and mtDNA gene sequences, and their phylogenetic implications. Tree Genetics & Genomes 1(2): 50–63. Retrieved May 7, 2008. Phillips, D. H., and D. A. Burdekin. 1992. Diseases of Forest and Ornamental Trees. Macmillan. Semerikov, V. L., and M. Lascoux. 1999. Genetic relationship among Eurasian and American Larix species based on allozymes. Heredity 83: 62–70. Wei, X.-X., and X.-Q. Wang. 2003. Phylogenetic split of Larix: Evidence from paternally inherited cpDNA trnT-trnF region. Plant Systematics and Evolution 239: 67–77. Retrieved May 7, 2008. Wei, X.-X., and X.-Q. Wang. 2004. Recolonization and radiation in Larix (Pinaceae): Evidence from nuclear ribosomal DNA paralogues. Molecular Ecology 13: 3115–3123. Retrieved May 7, 2008. This page was last modified on 28 August 2008, at 21:14.